Apple‘s television advertising has been key to the renewal of Apple loyalty and excitement in the world. The Think Different campaign, launched in 1997, was a central factor in Apple’s recovery from financial difficulty, winning admiration for creativity as well as focused attention for new products. Steve Jobs had just returned to the struggling company, Apple. Jobs and Lee Clow had collaborated back in 1984 to launch the MacIntosh. Now was the time to recover the sene of Apple’s place in the world of creative users. 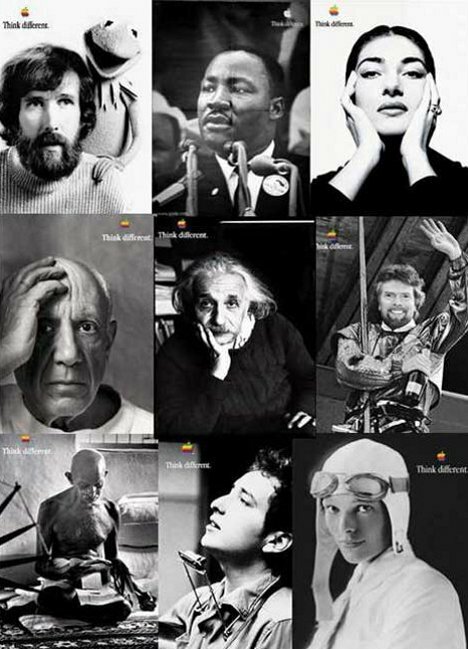 The TBWA Chiat/Day team said that Apple should be aligned with the creativity of personalities and people making an impact on the twentieth century. The “Think Different” phrase provided an opportunity to celebrate both the creativity of these people but also the distinctiveness of Apple in the computing world, responding to IBM’s historic campaign motto, “Think”. The campaign was swiftly approved by Apple, then begun with the television commercial, which first ran on Sept. 28 1997, followed by the print ads, billboards and posters. In 1998 the television spot won the second annual primetime Emmy Award for best commercial from the Academy of Television Arts & Sciences (ATAS). The ad also won a Belding, a Silver Lion at Cannes. The long term campaign won an Effie award for marketing effectiveness. There’s an excellent write up of the Think Different campaign at Wikipedia. The Apple Think Different campaign was developed at TBWA\Chiat\Day, Los Angeles by chief creative officer/account director Lee Clow, creative directors Ken Segall, Rob Siltanen, Eric Grunbaum, Amy Moorman, art director/executive producer/director Jennifer Golub, art directors Jessica Schulman, Margaret Midgett, Ken Younglieb, Bob Kuperman, Yvonne Smith, Susan Alinsangan, copywriter Craig Tanimoto. Think Different was edited by Dan Bootzin, senior editor of the in-house arm, Venice Beach Editorial. Stock phototography and film research was carried out by Susan Nickerson, owner and head stock-footage researcher with Nickerson Research. The ads are available to view online. Apple did have a page dedicated to the campaign but have now withdrawn it. RedLightRunner have the Think Different Posters for sale along with a 10 mb copy of the original commercial. Gary L. Gray, associate professor in engineering science and mechanics at Pennsylvania State University, hosts what he calls Some Cool QuickTime Movies, mostly ads for Apple. Included on this page is the original commercial, a version including Seinfeld, and a parody with the same voiceover but this time featuring love/hate characters, including Charles Manson, OJ Simpson, Ronald Reagan, Bill Clinton, Ellen Degeneres, Adolf Hitler, Beavis and Butthead. Stephanie Clarkson has had a desktop image page based on the ad, since it aired in 1997. She gives biographical details for each of the people featured in “Think Different #1”.